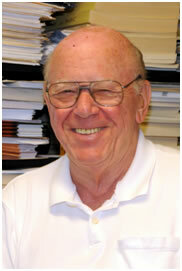 Harry Hilton is Professor Emeritus of Aerospace Engineering in the UIUC College of Engineering. His research areas include Structural Mechanics/Structural Dynamics, aeroelasticity, composites, and viscoelasticity. Some of his academic positions include Aerospace Engineering department head UIUC 74 - 85, assistant dean of engineering summers 1989 & 90, Alfred M. Freudenthal Visiting Professor, Leopold-Franzens-Universität, Austria, 1995 and Charles E. Schmidt Distinguished Visiting Professor, Florida Atlantic University, 1997–2001, 2007. Hilton has served in several faculty governance roles. These include Chair of the UIUC Senate Committee on Academic Freedom & Tenure, Faculty Advisory Committee, Senate General University Policy Committee and the Senate Executive Committee. Currently he is a member of the UIUC Senate and Chair of its Committee on Equal Opportunity and Inclusion. Within the UIUC Chapter of the AAUP he currently serves as President and is a member of the Policy Committee. Previously he has been chair of the Academic Freedom Committee and Chapter president in 1959-1961 and 1969-1971.
necessarily represent the views of the national AAUP or any other entity.